I’ve been wrestling with my blog lately. Oddly, I’ve allowed all sorts of irrelevant nonsense (feeding children, vanquishing squalor) to get in the way. And this has made me sad. Not the fed children or the less horrid house, but that it doesn’t matter how hard you try they’ll be hungry/grubby again before long. So I’ve decided that the way to solve this is to boss myself – to create a thing that must be obeyed as clearly, left to my own devices, I’m unable to actually do the thing I want to do. Instead, I’m to be found frittering on Facebook or snacking. Weird that, isn’t it? Surely, it would be simple to just do what you want to do instead of things you don’t want to do both of which you are doing instead of the things you ought to do. Sigh. While avoiding either writing or doing anything useful, I have elevated to-do lists to an art form – three colours of ink, a ruler as well as an actual app that pings. It’s amazing with all this, I have time for all the snacking. 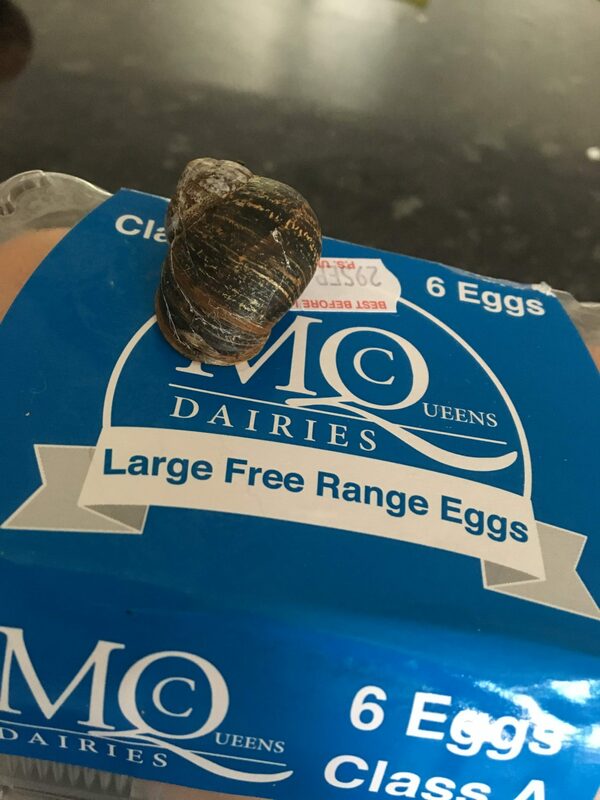 When you find a snail on your eggs – IN THE FRIDGE! And then, presuming the snail has frozen to death, putting it in the bin only to find it slimeing its way out again. But it’s no good. Really. 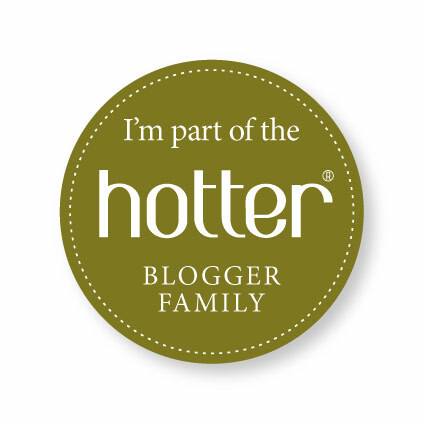 Blogging is like exercise or spinach – you don’t fancy them much but once you get going you remember that you like it. And I’ve noticed that there are a little over 100 days before the end of the year. Out of the corner of my eye, I’ve also noticed various hashtags about 100 something or others so I’ve decided to launch my own. So, what exactly am I going to surprise and delight you with, dear reader? Good question, indeed. Well, there’s the thing about the writing group where all the bit-part women in fiction are allowed to vent their anger – it’s probably funnier in my head. Or the post that rants about the fact that nouns are mutating into verbs. Maybe they always have, but the process is speeding up ‘accelerator pedalling’ if you like. And I’m sure there’s a hilarious punchline about ‘arseholing’. Watch this space. Or don’t, you’ve probably got something better of your own to do. 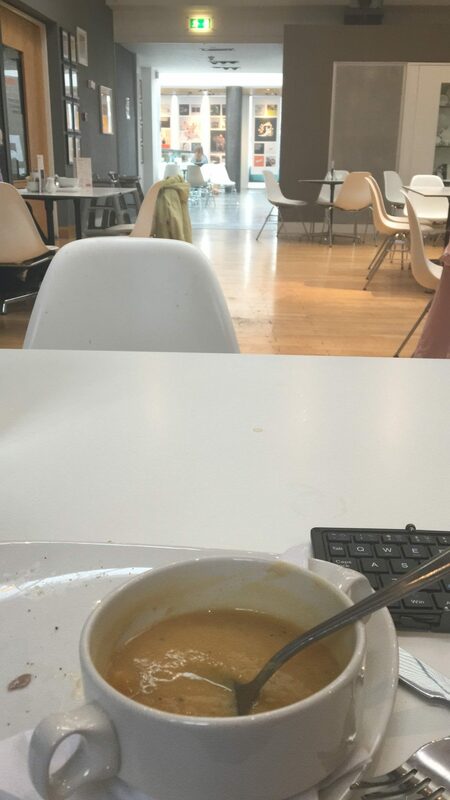 The first of – hopefully – many lunchtimes of writing… and soup. ◄ 14 years at the school gates: what I have learned so far….